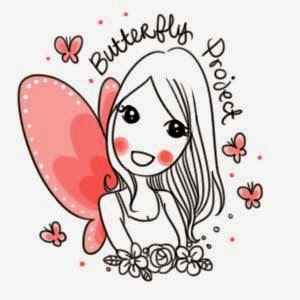 For most Asian girls like us, the bane of our existence is small eyes that looks shifty and doesn't perfectly portray our beauty. So what do we do? We pile on eyeliners and mascaras to create those perfect looking peepers that will drown whoever looks at us into the depths of our soul :p Ok, so maybe I'm being a little dramatic, but don't tell me you've never spent long minutes just coating your lashes with lots and lots of mascara just to lengthen and curl your lashes a little bit more to have the desired effect. Cos I know I do. But that was before I discovered Maybelline's The Falsies Big Eyes Mascara. As far as I know, Maybelline is actually the first mascara I've seen in the market that comes with two brushes, one big brush and one microbrush. 2x brushes for 2x bigger eyes! Because they have two brushes, these brushes has multiple uses. Big brush for drama volume on the top lashes, and a smaller brush to perfect inner, outer corner and lower lashes. 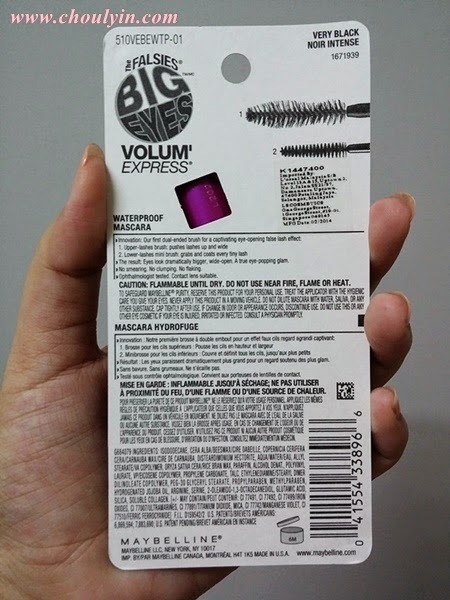 For those who love natural volume, you can also use the small brush for top lashes too. The Upper lashes Pump up Brush pushes lashes up and wide for a volumised full fan effect, and the Lower lashes Sculpting Mini Brush grabs and magnifies the look of each tiny lash to eye-opening effect. For the upper lashes, it comes with a twisted brush. Not sure if you can see it from here, but I've used flash so hopefully it's clearer. 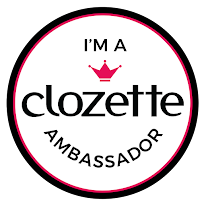 Usually for me, when I use mascara, I will roll the wand out during application to try to coax the lashes to curl a little more. For more volume, I will repeat this process a few more times, until I am satisfied with the volume that I want. 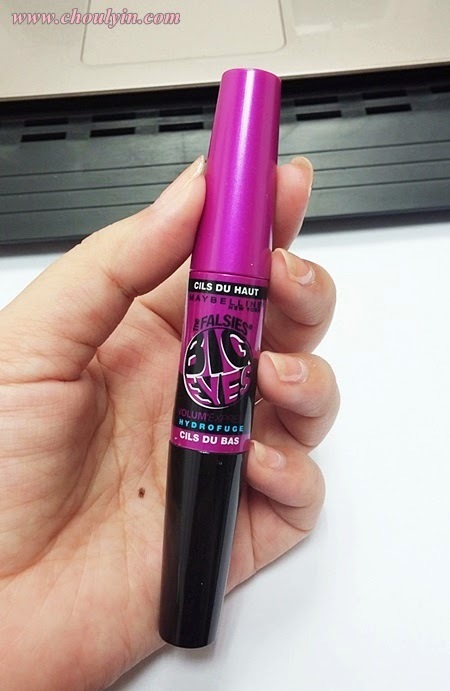 Best part is, the mascara doesn't clump like other brands out there, so two thumbs up for this too! For the lower lashes, it comes with a thin and long brush. It's a very small brush, so you can easily reach all corners of your lower lashes and coat all of them evenly. If you want even bigger peepers, you can also use it for the inner corners of your upper lashes. In terms of lengthening the lashes, it doesn't do much. You can see that the lengths for both my lashes remain about the same. Left is with the mascara, right without. As for the formula, I think both sides have the exact same formula. 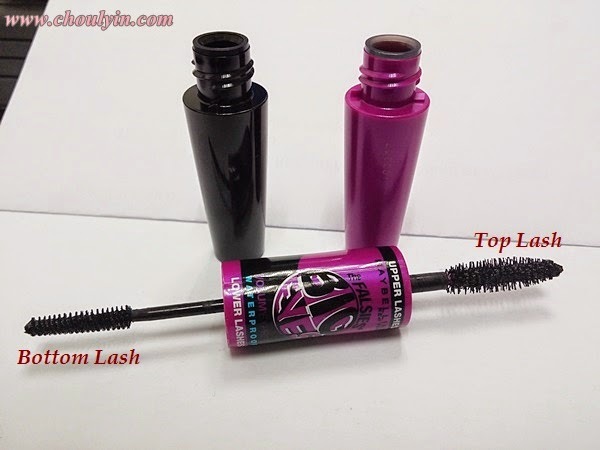 Maybelline claims that it is waterproof mascara with great hold power. If there's one thing I believe about Maybelline's claims that it is waterproof, it is REALLY waterproof. I have had quite a number of waterproof mascaras from Maybelline (the Falsies range, definitely), and they always deliver when they say that it is waterproof. With my eyes opened, you can obviously see the curl it gives to my lashes, and the lower lashes are pretty evenly coated. 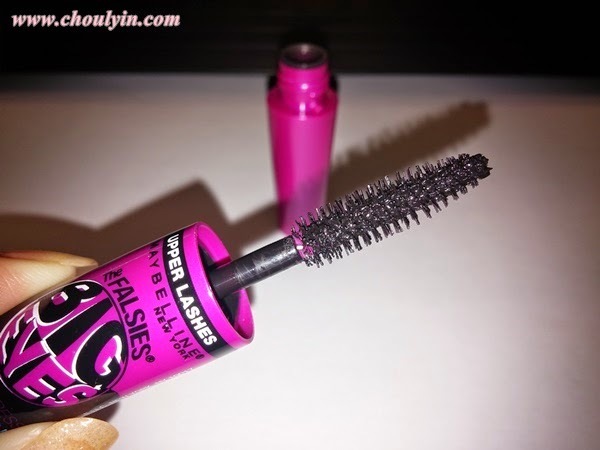 Upon application, the mascara dries pretty fast, and curls my lashes nicely. I do not need to run it through many coats, just about two to three coats will do. It holds the curls quite well, so I don't have to worry about it drooping throughout the day as the holding power is quite strong. Now with both eyes coated with the mascara on the upper and lower lashes, and full on eyeliner to complete the look :) Love how it makes my eyes pop! 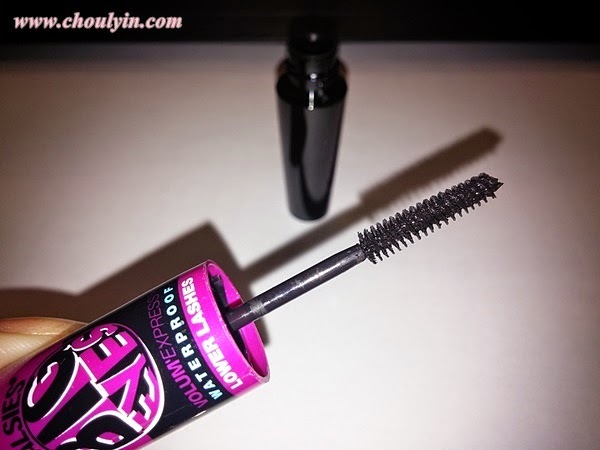 What I love about this mascara would definitely be the microbrush, where you can use it to coat my lower lashes. Normally, I don't always use mascara on my lower lashes because the wand is always too big that it accidentally smudges my undereyes, and I have to clean it up and reapply my face powder all over again. Because it's a small brush, I don't have to worry about accidentally getting some mascara on my undereyes. 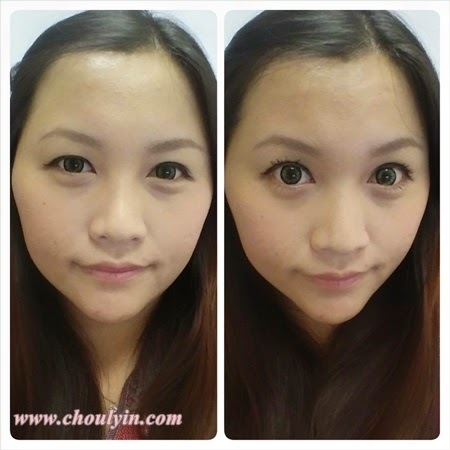 And seriously, after application, my eyes look really different as the coated lower lashes really helps to create that Big Eye Effect! 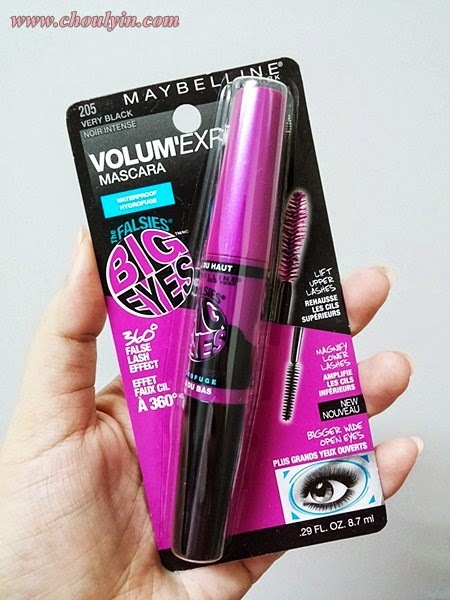 The Maybelline The Falsies Big Eyes Mascara retails for RM45.90 per bottle at all major drugstores, and participating supermarkets and hypermarkets. I would definitely suggest for you to buy this as you will not be disappointed.